After visiting Hoboken and campus, Aashray Harishankar ’18 asked himself a simple question, "where can I see myself living for the next chunk of my life?" It didn’t take long before he landed on the Music and Technology program at Stevens. He felt a connection to the professors and appreciated how the small class size would allow him to tailor his education. 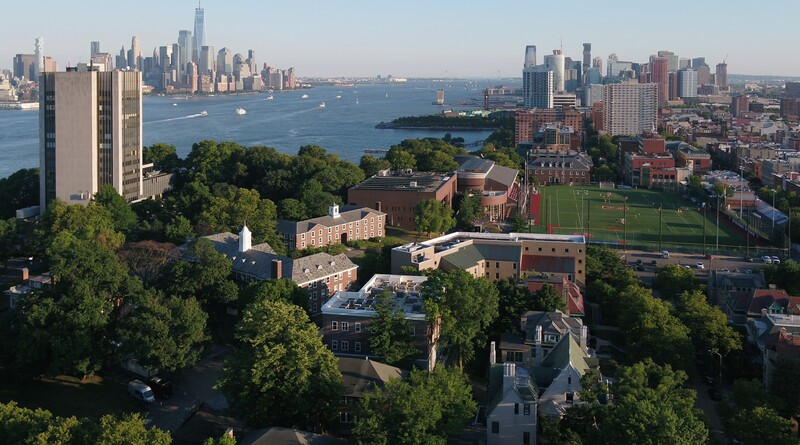 Studying at Stevens would provide him cutting edge skills, while living so close to New York City would open up professional opportunities. Harishankar's goal is to break into the film industry, and since leaving Stevens, he's been steadily working towards this dream. Recently, we caught up with him to see how he's doing and how his time within the College of Arts and Letters set him up for success. I recently finished an internship program at Remote Control Productions, which is a collection of studios owned and operated by Hans Zimmer, including composers like Ramin Djawadi, Henry Jackman, Benjamin Wallfisch, Lorne Balfe, Rupert-Gregson Williams, and others. This is the hub of music for many of the major films that come out every year, and it has been quite a learning experience to understand how it all works. I was responsible for the different facilities on campus and helping out with daily tasks that needed to be done in order for the company to function smoothly. Editor's Note: Harishankar has also been creating new music, including the below track titled Run, with his band In The Works. What jobs do interns take on? Interns are assigned to many different tasks when assisting composers, management, and security, so we facilitate a lot of the general activity on campus. Interns also get to sit-in with composers, audio engineers, and others to watch their workflow and to learn and discuss more about the job and industry. It’s really a great program for aspiring composers and musicians alike. Before working at Hans Zimmer’s Remote Control Productions, did you intern anywhere else? I worked as an intern at Studio Center in Manhattan, where they edit and mix audio for radio and television spots. Most of these involve voice over talent, and so they have people come in to record dialogue for these clients, whether for an ad, audio book, or TV spot. I was able to help with some of the editing and mixing myself, and learned a good amount about the industry in the New York area through the leading audio engineers there. I also worked with composer Rick Sherman in Irvine, CA, while home in 2015. How did the Music and Technology program at Stevens prepare you for these roles? The Stevens education was a unique experience for me because of my interest in film music. The general curriculum is very balanced and offers elements of composition, production, audio engineering, and programming, allowing students to be efficient, creative, and ambitious when it comes to our own projects. Many students come out with the ability to tackle their area within the music industry with a great foundation of knowledge, a high level of skill, and ability to adapt. Editor's Note: Harishankar's talent and ability is clear on his preview track of The Sweetest Thing, featuring Kiera Dillon. I was lucky enough to take many film classes with Professor Pennino and recently retired Professor Foster, as well as get in-depth sessions on film music and the industry with Professor Brick. Professor Harari also helped me understand the technological workflow and how to oversee large productions, both creatively and logistically. I took on two sound design projects in which I was able to score music to picture. This really gave me hands on experience on the thought process behind writing music for picture. All these tools are really important in the film scoring and composing profession, so the fact that I was able to tailor my education with these classes and professors, who were willing to accommodate my passion, was a major plus for me. What made you choose to come to Stevens? There are many reasons why I chose Stevens. When I was applying to colleges I was looking for programs that could give me a comprehensive understanding of music composition and production. Stevens’ music program was still very young, yet it had just been awarded “Second Most Innovative College Music Program”, just behind Berklee College of Music. This intrigued me, and so I began to research into the university and its Music & Technology program. Looking at the curriculum, I was pleasantly surprised to find such a good balance of creative and technical direction from a university so focused on science and engineering. The size of the program allowed students to take a little more control over their education by developing close relationships with the professors. It also allowed the professors to be more thorough with their class time, with projects, and with the development of each individual student. The turning point came when I decided to visit Stevens in late-April, just a week before I had to make my decision. Professor Brick, the Music & Technology Program Director, graciously offered to give me a tour of the facilities, talk to me about the program, and introduce me to the other professors and students. It was nice to see what the program was like, in addition to seeing Hoboken and New York City. Being from Southern California, it was quite a different way of life, but it excited me. From the moment I arrived, I got a sense of the potential that came with being in such a tight-knit community and being so close to one of the biggest cultural hubs in the world. I am looking to continue my passion for music by finding people who align with my vision and will both support my endeavors and inspire me with new experiences and perspectives. I am fascinated by music’s relationship with the human experience and its ability to affect cultural change, and I continue to explore these connections. Whether through film music or otherwise, I hope to make a positive impact on the way people think about and experience the world around them.